Kyle Shanahan: "Is my goal to just manage the game, or to win the game?" 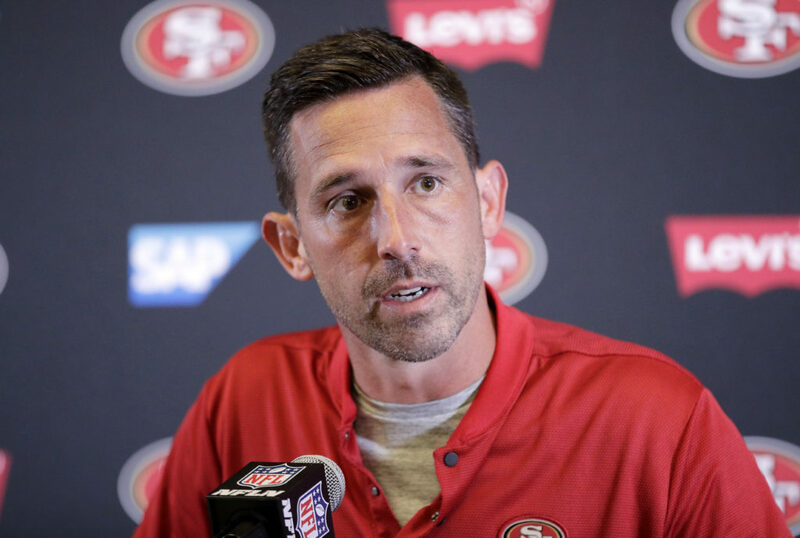 SANTA CLARA — This is the transcript of Kyle Shanahan’s Week 4 Monday press conference, courtesy of the 49ers P.R. staff. Is Staley’s issue the same thing that he’s dealt with off and on over the last four or five years? Do you think about moving McGlinchey to left or do you not want to–? It seemed that one of the bright spots yesterday was TE George Kittle connecting so well with QB C.J. Beathard. Obviously they have the background with Iowa, but it also seems that C.J. is a lot more comfortable throwing to him. The ball is always right on target. Is there something to be said for him knowing how well he runs? On the 82-yard touchdown pass Kittle caught, what was the name of that play or concept? Is that a west coast offense concept, play? Is that something former 49ers head coach Bill Walsh would’ve used? Can you take me through the play, what Kittle did, how he won? How good is Kittle right now? Beyond the health, he’s talked openly about how last year he felt like he was kind of lost and swimming a lot in the playbook. How much growth have you seen in that regard from him? It seemed like Los Angeles Chargers QB Philip Rivers wasn’t super aggressive pushing the ball down the field. Was that an indication that DB D.J. Reed Jr. was doing well on the back end or what did you make of Reed’s play? Do you anticipate he is going to hold onto that starting job? Do you need to consider other personnel changes on the front seven of that defense considering how the tackling has been? I know there’s been talk about C.J. needs to get the ball out of his hands faster. But, part of his game is that he’s willing to hang in there. A lot of times you just have to do that. But, he gets pounded. What level of concern do you have about him surviving for 12 more games? It wasn’t his fault, but the roughing the passer, I think it was on Los Angeles Chargers DE Melvin Ingram III, when the pile drove him into the ground. How many times do you look at a play and say, “It’s time for QB Nick Mullens?” Did you think C.J. was going to get up from that hit? Along the same lines though, he’s pretty fearless when he tucks the ball and runs. Is it a balance between getting him to try to be safe in those situations and not taking away just his natural mentality of it? How much self-evaluation do you do in terms of game management like maybe at the end of the half where that possession only took 13 seconds off the clock? Should that punt have gone out of bounds so that there wouldn’t have been a return possibility? On the last offensive play, the interception, is that up to C.J. to recognize that blitzer or is that somebody else’s responsibility? Do you think it was a mistake by them and not taking advantage of his lack of experience? What should C.J. have done in that case? You were talking earlier about protecting C.J.. One way to protect him is to run the ball. You came into the game averaging five yards per carry and your running backs yesterday averaged about four yards per carry. Why did you choose to run so infrequently? How did DB Greg Mabin play and do you anticipate rotating going forward or is he maybe going to get more snaps? I’m wondering if you have a chance to get another quarterback? Are you looking for a guy that’s going to be on the practice squad? Are you looking for a veteran that can serve as a backup and Mullens goes back to the practice squad or has that been determined? Along with the unusual roster situation, WR Victor Bolden Jr. is eligible to come out this week. I know you don’t have to do anything right away, but what’s the plan there? How much X has Bolden played? You brought in seven quarterbacks last week. Are you going to bring in more tomorrow as well? Dude – please try and manage to win the game……. Heck of a game winning drive by Mahomes tonight. Switching to his left hand while sprinting and shuffle passing as he’s being dragged down was outstanding but not even his best play of the drive. 2nd and 30, from his own 31 yard line, running for his life he fires a 30 yard laser for a reception and puts them in position to continue the drive to win the game. He is fun to watch, a combo of good quarterbacks and one point guard , he reminds me of Steve young, joe Montana , Michael Vick and Stephen Curry all rolled into one great quarterback . Yeah but did you see Trubisky throw six touchdown passes yesterday? Seemed like the receivers were wide open all day, but MT threw some dimes, too. Aaron Lynch had a sack, and interception. MT is a mobile QB, with good accuracy. Sure helped to have a defense that shut down the Bucs. Mahomes also is mobile and elusive, but that left handed pass was his most impressive pass of the day. Yes I did Grant, I had just cut him in my fantasy football league for inaccuracy! Boy am I stupid! Do you think he will keep it up? Yep, let’s see what he follows that performance up with. He’s been pretty inconsistent so far. Uh huh. Let’s see how Mahomes plays after 16 starts. He got the benefit of a couple extra seconds on the time clock on that drive. I guess when things are going good for you refs don’t want to kill that good story. Yeah but c’mon man we got Soloman Thomas! I think it was extremely hard to run the ball with the way they were playing. It didn’t feel like that was the best thing to do…… I did not think we were running the ball well….. It’s an eight-man front every single play and they’re running pressures to stop the run, to me, not for the pass. So, I felt good with what we did, just didn’t get it done. There it is…. Perhaps if the D wasn’t giving up the 6th most points in the league, the 12th ranked scoring offense would have had gotten it done. Most of the time when an offense puts up 30, 27 and 27 points in 3 games, a win is a likely outcome…. Unless you have a Saleh coached D anyway. It is what it is. The defense scored seven points. The offense scored just 20. With CJB but sure, got me there… 27 points yet the defense still broke. Wish Grant had asked about wasting time outs. His goal should be to win the game with good game management. Shanny is not the reason they lost this game, Sebs. its been the mistakes of a young team, for the most part. Remember George Allen? That is why his teams were filled with veteran players. He could not stand the mistakes of young players, didn’t have the patience to let them grow. Do YOU have the patience to let life grow? Like a flowering bud in the garden?